Rapidly thriving on the cusp of renewable energy trends, the U.S. energy storage market has been a part if a favorable commercialization portfolio in the recent years. With stringent regulatory concerns on the use of fossil fuels and supportive government funding, the United States has made considerable progress in the production of renewable energy. The region, in fact, is serving as a lucrative investment ground for companies, with a number of biomass, solar, and wind energy production projects underway. These large-scale projects however, not only validate the vast potential for renewable energy generation but also highlight the massive growth opportunity for the U.S. energy storage industry. Taking into account the technological aspects of the market, lithium ion energy storage batteries are gaining tremendous traction of late. In fact, if reports are to be believed, the lithium ion segment accounted for more than 90% of the U.S. energy storage industry share in 2017, owing to the favorable characteristics of batteries including light weight, improved charging rates, high storage capacity, and relatively long service life. According to reliable reports, in 2017, the U.S. energy storage market was pegged at USD 400 million and is further expected to garner hefty proceeds with the rising deployment of renewable energy projects in the region. Given the bright growth prospects and the expanding renewable energy industry in the region, prominent energy storage companies are expected to make the most of the opportunity to strengthen their footprints in the U.S. market. Recently for instance, C&D Technologies, Inc., announced that it has entered an agreement to buy Trojan Battery Company LLC., to expand its energy storage battery portfolio and cater to the escalating regional demand. According to sources, the Pennsylvania-based C&D company – Blue Bell, will be offering lead-acid batteries & battery systems that are used to store and transmit electrical power, while Trojan will be supplying deep-cycle batteries for stationary and motive applications. In yet another significant instance, Sunnova, the U.S.’s major residential solar storage service provider reported that it was expanding its offerings to the Lone Star State, as it delivers SunSafe solar-plus-battery storage to homeowners in its home state of Texas. It has been reported that Sunnova’s solar plus battery storage offers the Texan homemakers with an extra layer of energy reliability and freedom that utilities can’t provide. It has been reported that Sunnova’s SunSafe™ offering in region includes a tailored solar plus battery storage technology system designed to replace energy that is normally consumed from the electric grid every day. Taking into account the geographical expanse, Texas has been the epicenter for transformative and renewable energy technologies for years. The growing deployment of renewable projects, energy storage systems demand will be playing a critical role in helping the region to gain energy independence. With such a rapid growth of renewable energy projects in the region, it has been observed that Texas will turn out to be a profitable investment hub spot for several U.S. energy storage market players. Speaking along similar lines, it is also prudent to mention that the share of renewable energy mix in California is also emerging at a rapid pace, in turn supporting the robust growth of the U.S. energy storage industry. In addition to the growing number of projects, another vital factor influencing positive industry outlook is the legislative body’s mandatory imposition on fossil fuels, in a bid to achieve GHG emission targets. Further elaborating on the competitive scenario, the U.S. energy storage industry players are also looking out of the United States to merge with potential contenders. Recently for instance, the OPG (Ontario Power Generation) has announced that it is joining forces with a U.S. energy-storage company Stem Inc., to provide battery based energy storage system to reduce electricity cost for the industrial customers in the region. Stem, for the record is a leading company operating in pairing lithium-ion batteries with high-performing software. The software is powered by Artificial Intelligence that stores electricity on site when power rates are the lowest. The systems then deploy the stored electricity to minimize customer’s reliance in the electricity grid during peak consumption hours and when the prices are highest. According to reports, Stem and OPG will be marketing these systems to industrial clients. The deal, according to industry experts will significantly help Stem to foray into the Canada energy storage market after completing projects in the U.S. and Japan. 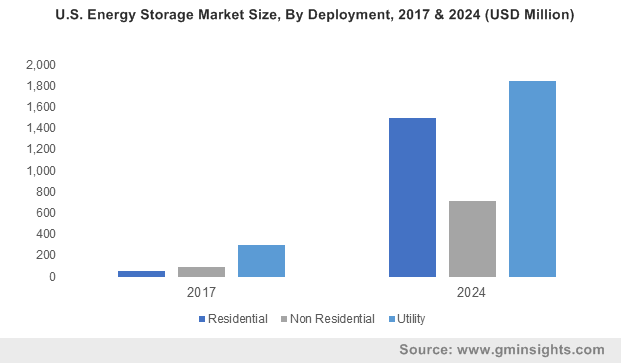 Driven by these on-going competitive trends, it wouldn’t be wrong to quote that the U.S. energy storage market is set to traverse along a lucrative growth graph. Some of the prominent companies catapulting U.S. energy storage market ahead include East Penn Manufacturing, LG Chem, Duke Energy, EDF Renewable Energy, Johnson Controls, GE Power, EnerVault, Invenergy, Tesla, Fluence Energy, SolarEdge, and ABB Group.